Odonata is an order of insects (class Insecta) encompassing dragonflies and damselflies, with members characterized by large, compound eyes, chewing mouth parts, a long and slender abdomen, and multi-veined wings that are typically clear or transparent. Odonata is a relatively small insect order, comprising about 6,500 species placed (Trueman and Rowe 2008). The word dragonfly is also sometimes used to refer to all Odonata. 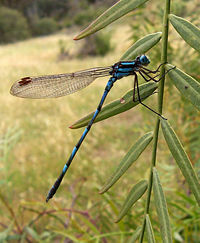 The term odonate has been coined to provide an English name for the group as a whole, but is not in common usage; most Odonata enthusiasts avoid ambiguity by using the term "true dragonfly" when referring to just the Anisoptera infraorder. Odonates contribute value to the ecosystem and to humans. Ecologically, dragonflies and damselflies are integral to food chains in both aquatic and terrestrial ecosystems. The aquatic larvae consume aquatic insects, invertebrates, and even tadpoles and small fish, while the adults consume terrestrial insects; in turn, the odonates are consumed by fish, birds, and so forth. For humans, odonates are valuable in that they consume large numbers of insect pests, including mosquitoes which can transmit diseases (Grzimek et al. 2004). They are also indicators of freshwater quality, and their various behaviors, such as their unique mating behavior, add to the human fascination with nature. As with all members of the arthropod class Insecta, members of Ononata have three pairs of jointed appendages, exposed mouth parts, an exoskeleton, a segmented abdomen that lacks any legs or wings, and one pair of antennae on the head. Members of Odonata characteristically have large rounded heads covered mostly by well-developed, faceted eyes, legs that facilitate catching prey (other insects) in flight, two pairs of long, transparent wings that move independently, and elongated, ten-segmented abdomens. In most families, the wings, which are large, multi-veined, and slender, have an opaque structure on the leading edge near the tip of the wing, called the pterostigma. This actually is a thickened, blood–filled, and often colorful area called a cell. Cell in this case means a closed area of an insect wing bounded by veins. The functions of the pterostigma are not fully known, but it most probably has an aerodynamic effect as well as a visual function. More mass at the end of the wing may also reduce the energy needed to move the wings up and down. The right combination of wing stiffness and wing mass could, thus, reduce the energy consumption of flying. A pterostigma is also found among other insects, like bees. Males have unique secondary genitalia on the underside of the second and third abdominal segments, which are distinct from the actual genital opening located near the tip of the abdomen (Grzimek et al. 2004). Grzimek et al. (2004) note that there are more than 5,500 species, while Trueman and Rowe (2008) report there are about 6,500 species placed into just over 600 genera. The two main groups are the damselflies (suborder Zygoptera) and the dragonflies (suborder Epiprocta), with true dragonflies in infraorder Anisoptera. Although generally fairly similar, dragonflies differ from damselflies in several, easily recognizable traits. Dragonflies are strong fliers with fairly robust bodies and at rest hold their wings either out to the side or out and downward (or even somewhat forward). 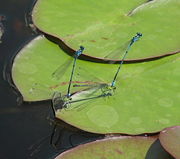 Damselflies tend to be less robust, even rather weak appearing in flight, and when at rest most species hold their wings folded back over the abdomen (see photograph below, left). Dragonfly eyes occupy much of the animal's head, touching (or nearly touching) each other across the face. In damselflies, there is typically a gap between the eyes. Wingspans range from just 20 millimeters (0.8 inches) in the damselfly Agriocnemis femina to 162 millimeters (6.5 inches) in the dragonfly Petalura ingesntissima (Grzimek et al. 2004), and up to 190 centimeters (7.5 inches) in the giant Central American damselfly, Megaloprepus coerulatus, and in Anax strenuus, a Hawaiian endemic dragonfly. Some very large fossil species have been discovered as well. With the exception of frozen, polar areas, odonates are distributed worldwide (Grzimek et al. 2004). Odonates are aquatic or semi-aquatic as juveniles. They may be found under stones, buried in detritus or mud, or holding fast to vegetation in running or stagnant freshwater; some live in moist terrestrial holes in forests or small water reservoirs in plants (Grzimek et al. 2004). Because most larvae are aquatic, adults are most often seen near bodies of water and are frequently described as aquatic insects. However, many species range far from water, seeking open fields and hilltops where they prey on smaller insects, catching these in flight. While almost all odonate larvae are aquatic, there are a half-dozen or species, from distantly related families, that have fully terrestrial larvae (Trueman and Rowe 2008). Larvae (which have a unique lower jaw specialized to grasp prey) and adults are active or ambush predators (Grzimek et al. 2004). Adults eat insects, which they can capture in flight, having excellent flight maneuverability; the larvae eat aquatic invertebrates, and even frog tadpoles and small fish (Grzimek et al. 2004). Mating is intricate and unique. It first involves the male odonates grasping the female on the back of the head (dragonflies) or the anterior part of the thorax (damselflies), utilizing claspers (caudal appendages) located at the tip of the male abdomen (Grzimek et al. 2004). This is the "tandem position." Male odonates have an organ (secondary genitalia) near the base of the abdomen in which they store spermatozoa. Prior to copulation, the sperm is transferred there from the genital opening near the abdomen tip when the male arches his abdomen. Then, forming the "wheel position," the female bends her abdomen forward to touch the male accessory genitalia and receive sperm (Grzimek et al. 2004). Eggs are laid in water or on vegetation near water or wet places, and hatch to produce naiads that become (in most species) voracious predators of other aquatic organisms. The nymphs grow and transform into the adult flying insect. Odonata has traditionally been grouped together with the mayflies and several extinct orders in a group called the "Paleoptera," but this grouping appears to be paraphyletic. What they do share with mayflies is the nature of how the wings are articulated and controlled. Odonates show up in the fossil record in the early Permian period. For some time, three extant suborders were recognized: Zygoptera (damselflies), Anisoptera (dragonflies), and Anisozygoptera (an artificial grouping, the ancient dragonflies) (Grzimek et al. 2004). All three of these lineages flourished in the Mesozoic, with Zygoptera and Anisozygoptera in the Triassic and Anisoptera in the Jurassic. However, more recently, Anisoptera and Anisozygoptera were combined in the suborder Epiprocta (in which Anisoptera is an infraorder) after it was revealed that the Anisozygoptera are a paraphyletic group composed of mostly extinct offshoots of dragonfly evolution (Lohmann 1996, Rehn 2003). Lohmann, H. 1996. Das phylogenetische system der Anisoptera (Odonata). Deutsche Entomologische Zeitschrift 106(9): 209-266. Rehn, A. C. 2003. Phylogenetic analysis of higher-level relationships of Odonata. Systematic Entomology 28(2): 181-240. Retrieved September 30, 2007. Trueman, J. W. H., and R. J. Rowe. 2008. Odonata: Dragonflies and damselflies. Tree of Life Version 20, March 2008. Retrieved June 4, 2008. All links retrieved December 18, 2018. Dragonflies and damselflies at the Odonata Information Network. 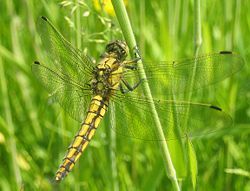 Maps, photographs and diagnostic information pertaining to dragonflies and damselflies. This page was last modified on 18 December 2018, at 15:17.